This is a note of thanksgiving and celebration to all of the hundreds of people who supported us during this year. It was fantastic and we finish up fiscal year 2014 with energy, strength, hope and plans for the future. This list of projects doesn’t even begin to show the microscopic world of relationship building and positive growth that we created and experienced. But, our yardstick still remains the same…To support at risk populations so they can improve the quality of their lives and to educate those who provide goods, services and financing so they can make informed choices about where to use their resources. As we say here, Mision Cumplida 2014. 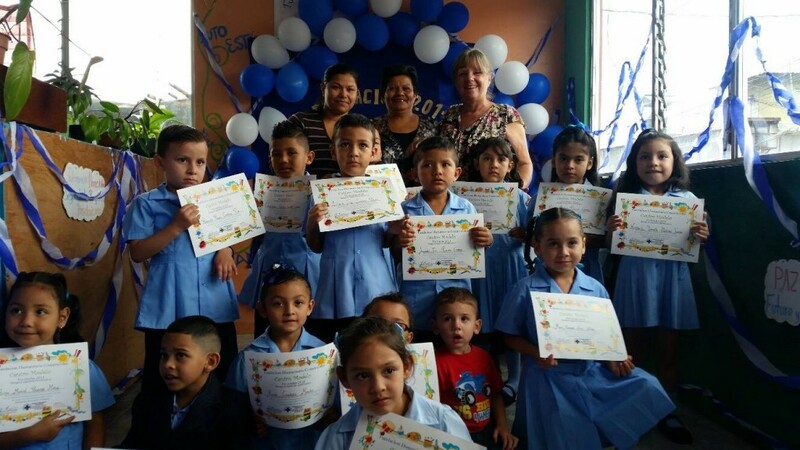 The Costa Rican government has a system of care for preschool age children, which provides a space, teaching staff and food for under served children. However, their Budget does not include funding for other kinds of activities, materials and infrastructure improvement. With the coordination of Marlyn from the CRHF and the director of the CENAI in Puriscal, we were able to turn the run of the mill daycare center into a special place for the children to learn and grow. The CPI/West Coast Connection volunteers worked to créate a safe and fun play área with a playground, mural, sandbox and painted designs on the ground. They also made a vegetable garden, a flower garden for the children to care for as they learn about the importance of the human’s relationship with nature as a steward. A second sandbox was created to give the sensation of being at the beach. The children were given art and educational supplies to work with as a donation and a space for a library was created, along with a cozy rug, big pillows to sit on and over 100 donated books. Each volunteer day included time to be with the children in healthy, productive play. This small school is located just outside of Puriscal and our Project here was to upgrade some of the infratructure of the school and créate a stimulating educational mural for the children. Our AAVE volunteers and their guides helped us to paint the preschool área, play with the children and, finally, complete a very large and colorful mural. We plan to continue working with this school during 2015. The director is a good friend of the Foundation and enthusiastically welcomes our groups. This school is also in the Puriscal area and after completing the construction of a classroom two years ago, we have continued to give support to the school through our volunteer presence. This year, the group from Alex Campbell in Canada made a beautiful long mural on the wall below the school and had the chance to work in the classrooms with the students. Our community library made in 2012 continues to flourish and be part of the community and the school. Another group from Alex Campbell in Canada this year helped to prepare the ground for a play area and to work with the students in the school this year. The People to People group of volunteers spent two days with us learning about clay production, ceramics and animal rescue right in Santa Ana. As a gift to the community, they worked with the children at the Artur Gough orphanage organizing them for games and crafts, including working with clay. They also worked on a mural for the community on a large Wall centrally located. These voluinteers are ambassadors from the United States and other countries that enjoy their homestay experience as part of their learning opportunity. For many years, we have been sponsoring groups of kids from La Carpio to leave the área and spend days with the volunteers outside in the fresh air, swimming, playing sports, having a healthy meal and learning different crafts projects. Thanks to the CPI/WCC volunteer groups, these children enjoyed a much looked forward to summer in nature. Turrucares is a small rural town with a population of farmers and small business people. The school is located on a Little plot of land and the teachers work hard to provide their students with all the services they need including English classes, special education and Physical Education. Lifeworks adopted this school this year and unbelievably in only ten work days installed a complete playground for the students and put up the walls, floor, roof and prepared for painting a new kindergarten classroom. This means that the school can move its old kindergarten into the new building and the old classroom will be used for the special education facilities. The current special Education classroom has been turned into a library! Lifeworks also donated new materials for the kindergarten, books for the library and paint for the school. Several years ago, as many know, I was donated a small “finca” in Turrucures by a North American who moved to Panama and was not able to sell the property. This finca is used by the Foundation for a variety of activites and has served as a safe shelter for Nela and her family for four years. This year, Lifeworks worked on fixing up the grounds, putting in a strong fence along the river, planting a vegetable garden and making a doghouse for Princesa who promptly gave birth to seven health English bulldog puppies. They made a mural and shared their time at the finca with one of the soccer teams we sponsor for a day out in the country. We are very grateful to the Lifeworks volunteers and leaders for their continued comittment to this finca and are happy to be able to share this sacred space with so many people from many different places. Puerto Viejo de Limon is the paradisical beach town on the east coast of the country. We have been working there for more than thirty years both as a Foundation as as individuals. Overland Adventures has been a partner in our endeavors for many years and have helped with construction of libraries, community centers, classrooms, gardens and compost projects. This year, we took on a big Project- the construction of a new classroom for the CINAI or preschool care center of the community. With their donation, we were also able to paint the building outside, provide materials for the children, get new mattresses for the children and, finally, to begin the construction of a much needed new classroom. Part of the experience for Overland as well is their participation in cultural activities such as cooking, eating at local women’s homes, the animal rescue center, the botanical garden tour and time to be at the beautiful beaches. While I am reviewing the projects from last year things keep happening in the present. Two great ones..I was thrilled to see Helen, the young mother we built a small “house” for in the backyard of her mother’s place with CDS and other voluntere help. She is looking great, has a job, her mother – with whom she could not speak just last year – helps to take care of her now three year old and she is reconciled with the father of her baby. They are talking about getting married. This is the difference a house and a little loving attention can make for a family. Now that we have worked in La Carpio for so many years, we feel we have developed a model of community development that is viable, fairly easy and very effective. We are working toward replicating our Carpio Model Education Center Model in other communities around the country and this year, the Overland group was the pioneer in this new endeavor. They went with us to the indigenous community of Amubri in the Talamanca mountains and helped to prepare two abandoned buildings for a new “life” as a center for family well being. This center will provide a place for preschool activities, health activities, youth seminars and workshops for all. Overland was also lucky enough to be in the community at the same time as a group of people who are bringing indigenous music to the public and we were honored to be included in a very moving concert by the youth of the community. In addtion, the group participated in classes on Bribri culture and language and a hike to a nearby swimming hole. In the night, we had the visit of a local shaman who was able to give us some of the history of the indigenous cosmovisión. We look forward to continuing our renewed relationship with the people of this community as we share ideas as to how to proceed with this Project. La Carpio continues to be the main place we put our resources and several years ago we began to coin the term “poverty eradication”. After more than twenty years in the community, we began to see very positive results from the efforts of the organizations that work in the community as well as the hard work of the people who live there. Gail participated in the writing of an academic paper that was accepted in a professional publication for social workers and as a result of this Project, we began to systematize our work and to better understand the implications of a replication of this model in other communities. This concept of poverty eradication gave a context to our work and also provided a strong base from which to explain what we are doing to the many volunteers who so kindly support our efforts. As in previous years, every volunteer who Works with us participates in at least one seminar sesión so that they can see their place in the Project with a different lense other than, “we came to help the poor children and played some games”. In this world that is so uncertain lately, it seems that the things we are doing can be a powerful tool to lessen the impact of poverty and the awful results of its presence. We would like to thank all the faithful groups and volunteers who were with us from the beginning of this social experiment and have been our guides and cheerleaders year after year as we see more positive change in this special community. No matter whose funeral it is…irs always sad. Here i piedades they ring the church bells one at a time very slowly as people file out. Everyone walks together to the cemetery. Whole families from great grandparents down to gret grandchildren. And all the families seem somehow related….salazr, morales, perez…..you cant be in the church without feeling the sadness….and the peace….its the father in law of one of our homestay families. He was very loved and his adult children jave cared for him for many years. Theres a lot of love here. We have learned over the years that a hungry person is not able to create a job, or raise a child, or get out of a negative relationship. Thus, our program of food providing continues with a Monday, Wednesday Friday distribution of fruits, vegetables and bread as a donation from the Automercado in Escazu. We also give out basic food baskets when asked…we have noticed that it is nearly always women alone with many children and no father of the children in site. This year we realized we have a very rich source of cultural identity with the older population of the community. They are the ones who lived the story of Nicaragua as children, lived the war and the eathquake, the government repression and the poverty. They are the ones who made the journey to Costa Rica in great uncertainty and anxiety. So, we began meeting with a group of abuelas on a regular basis and the group from SOKA university were kind enough to begin the documentation of their stories. The group soon became solidified and ran a small thrift store to earn some pocket change. They are taking crafts classes from dona Fatima and have even helped us with volunteers by serving as guides. Through a lottery process, two of the abuelas were chosen to have a house upgrade and the groups of Overland, Lifeworks and WCC helped to make their houses more liveable. We look forward to continuing with this group of strong, inspiring women during the coming year. We know that some houses in Carpio are on the edge…of the river, of the Cliff…of the hill. And so, it was, that two houses were nearly destroyed this year in heavy rains. Luckily, the Overland group happened to be here the day after one of the houses went down the Cliff so they kindly jumped in to help provide them materials and the labor to rebuild the house with a better foundation and stronger walls. For another house, we provided the materials to rebuild. We also helped with a retaining Wall for the house of Dina whose house was falling into the neighbor’s house with Lifeworks and Overland. Helen is a young mother who was living in her own mother’s house. It was an overcrowded situation and Helen began to have difficulties with her mother. So, we built her a Little room right off the side of her mother’s house..and more than that, we cleaned up the back yard and painted the mother’s house. With the program Luz para mi Pais from Country Day School, ingenious bottle lights were installed in this and six other houses. Now, there is a beautiful, glowing, rainbow like light in these previously dark and dreary houses. Grant Denmark is a volunteer from West Coast who was determined to make a difference in la carpio even after returning to the States. He motivated us to organize, with the help intern Eli Rosenberg, a railing to be placed on the 120 steps going down to the Virilla River where over 1,000 people live. Climbing up and down those steps going to and from school, work, and meetings is a major challenge and a safety hazard especially in the rain and dark. We found that in order to put in a railing, we had to rebuild four retaining “walls” – in other words, to make four different concrete block walls. With the help of Esperian company volunteers we began that mammoth Project and continued with it all of June and most of July until we had created a beautiful, strong, safe way to get down the stairs. It was so gratifying to see pregnant women holding on to the railing, Little children using it for balance and older people pulling themselves along with the rail. The secondary effect was that we began to become friends with the people in that sector and that soon morphed into kids play dates, interaction with the disenfranchized youth and support for the mothers. This railing worked out so well that we promptly made another one down to the Torres River with the ISA volunteers. We learned years ago that murals are a powerful educational and inspirational tool that people see every day and begin to incorporate into their mental structure. This year we produced many murals, but the one that really brought home the important message is the Dream Wall for which community members were interviewed and then their thoughts were put upon the wall. These messages give ideas of a better future to everyone who passes by. Jeff Fisher, long time friend of the Foundation has motivated us to keep working with this challenging group of youth. We have a place to meet with the boys now – the bar/pool hall of Gerardo – and have built a small addition to his place that will eventually become a pizza parlor/small business for the boys. However, we have to do some preliminary work first. One of the boys is now going to chef school, having passed the Food preparation initial course. The others are slowly becoming more open to our presence and are participating more solidly in our activities. We thank the Common Ground group for all they have done to keep me motivated with these boys. And, they do love the condoms donated as well as the seminars on reproductive health. With Catalina, a volunteer from Argentina who came with the Patch Adams group, we have been able to slowly, ever so slowly, get these boys really talking about their lives and, as a result of a very long term dream of the Foundation, they are working in natural clay to create “something”. Thanks to the support of Jorge Quiros and the ISA volunteers, we continue to provide preschool, after school tutoring and support and community activities and outings to the population of children and adults who live along the River and in this section of the community. The United World College students and teachers continued their program of youth education during the whole year, allowing the older children from this sector the chance to share with others of their age and to talk about shared problems. Color My World volunteers helped to continue our programs in la Libertad and of course, made a mural with a global map on it! Our Montesori daycare continues to function as a place for women to leave their children when they go out to work. Thanks to volunteers groups, we continue to provide rainy afternoon activities to these kids. This year we hosted a group of children from the Rio Virilla on Saturdays and It was truly amazing to see how much more alert, confident, strong, healthy and creative the Montesori kids were. The stability and reliability of this program is to be commended. When volunteers walk into the Centro Modelo, all they can say is “Ahhhhh”. It is so peaceful, stimulating, creative, happy and spiritual there. Fatima has now completed her curriculum for a full year of school and we will soon be publishing this material to be shared with other informal preschools. Probably the most significant activity done in this center is the yearly Independence Day Parade when the children dress up like the person they want to be when they grow up. It is so special to see these children accompanied by their parents – more and more dads are showing up – as they march through the town being doctors, teachers, police officers, princesses and lawyers. We continue to present the play to everyone who comes to work with us and are very gratified when volunteers cheer us on. The quilt book is still presented and the women and children are constantly updating their play. We have been to several cultural events to learn about how to become better actors. This campaign continues as all groups help to houses and make bottle gardens, clean up trash and give information about recycling…pass out toothbrushes and toothpaste and bring in art, music, theater and dance. It’s working. Special thanks goes to our incredible team in La Carpio for all they do for their community, the Foundation and the volunteers. Yari, Yorlin, Aracely, Maria, Yaki, Veronica, Nina, Cidieth, Lucia, Rosario, Luisa, Francis, Fatima, Fatima daughter, Angela, Gloria, Katya, Diana, Helen, Luz, Maria, Ligia, Maura, Aejandro, Marcos, Lester and all their children have shown love and strength and tolerance as they work under conditions that are sometimes difficult and still live in the community and share their knowledge with their neighbors and the multiple numbers of volunteers who come through. As always, our homestay families provide a place of safety and nurturing to return to every day after going through the experience of visiting the different places and doing the hard physical labor. Well organized by coordinator Lorena Calvo, we were once again proud to know that every one of our volunteers was well fed, well housed, well cared for and well supported. Ah, what a team those two are! We finally found a great school for Kela, SEAS, right in Santa Ana…they are really teaching her and she is really learning. It rocks my world when I see her with a real three ring binder with worksheets and talking about the art project she is working on and having her review finally the times tables. These folks know what they are doing with our girl! Nela continues to struggle with the repercussions of her years on the street and is having some not unexpected health issues but there is still no one who can handle a group of kids or volunteers like her…Her relationship with Kela is very nice, like two good friends, one of whom has more “authority” or experience. It’s fine. This is a miracle and I am thankful every day for the presence of all these young people in my life..Nela, Kela, Sara, Adriana and Matti my grandson. We are so happy to complete the year with all our books up to date and all accounts turned in to the accounting firm. Going through the process of preparing these reports is a wonderful, albeit tiring, activity that makes me feel as if I can actually feel and know every single penny spent during the year. Many thanks to Maria Love, Sara Rodriguez, and Jenny Godinez for their support in this time consuming project. A special thanks to our Board of Directors, Chris Thomas, Fresia Tracey and Sara Blanchet for the faithful and steady support for what we are doing. They went through a learning process last year and have each adjusted to our system of work. Each one brings so many valuable skills to our organization and together we have created a formidable team. Chris for her expertise on the indigenous projects, Fresia for her international experience with many organizations and Sara for her accounting and computer technical skills. But we are all multi talented and are able to work together to problem solve and plan for the future. We are also proud to be able to partner now with the Wells Mountain Foundation in New Jersey as the organization that receives all tax free donations from the states. They are a great group of people who work to provide scholarships to mostly African students who want to get a higher education so that they can help to solve problems in their own countries. On a final note, we would like to give a fond farewell to little Angie who passed this year. She was at home, in peace and with her mother. She said, Ma, Ma and quietly went to her next phase. Sad for all and we are still processing it. I think that a parent never gets over the loss of a child. We have many ideas for the coming years of the Foundation and look forward to continuing with our mission of making life more bearable for the most vulnerable populations..in Costa Rica and elsewhere. With this we complete the report for the year of 2014. We will have our annual Christmas party for 300 children in the month of December and then will be preparing for our new year with all its exciting new initiatives and efforts to meet our goals. So many people helped us this year and so many supported our ideas and activities. Thank you to everyone.